T-Mobile CEO John Legere today continued pushing for the proposed merger of T-Mobile and Sprint, this time sharing a blog post focused on jobs. The New T-Mobile will spend nearly $40 billion to expand its network and business over three years, Legere says. The CEO also claims that the combined company will have more than 11,000 additional employees on its payroll by 2024 compared to what T-Mo and Sprint would have by themselves. Focusing specifically on customer care jobs, Legere reiterates that the New T-Mobile will open five new Customer Experience Centers, with locations in Overland Park, KS; the Greater Rochester area of New York; and in the Kingsburg area of Fresno County, CA. Each new center is expected to create around 1,000 jobs. T-Mobile also plans to transition Sprint’s “largely overseas customer care model” to a more domestic-led model. With these efforts, New T-Mobile plans to create 5,600 customer care jobs by 2021. 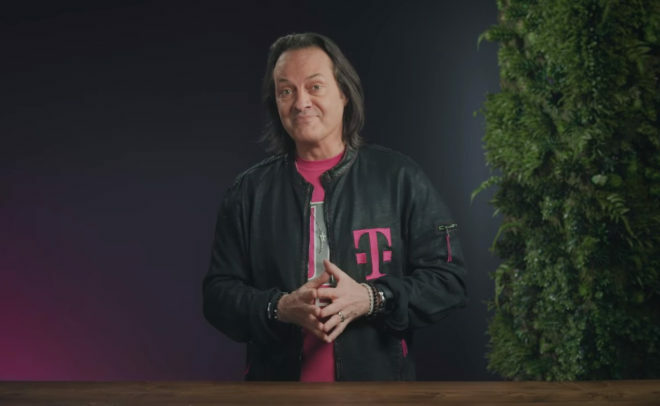 Legere adds that he expects New T-Mobile to employ more than 7,500 additional customer care workers by 2024 than the standalone T-Mobile and Sprint would have. Finally, Legere reiterates that New T-Mobile plans to open 600 new stores to serve rural and small towns. Jobs have been a major focus of the T-Mobile-Sprint merger, both for those supporting the deal and those opposed to it. The Communications Workers of America (CWA) has been one of the more vocal opponents of this deal, with CWA president Chris Shelton appearing in government hearings and claiming that the merger is likely to eliminate 30,000 jobs. Shelton has also called out T-Mobile for its iWireless acquisition, saying that T-Mo closed all iWireless call centers and the majority of its retail locations. “Trusting Sprint and T-Mobile with American jobs is like trusting a vampire at a blood bank,” Shelton recently said. Legere briefly mentioned the CWA in his blog post today, claiming that the CWA used “projected layoff numbers from an analyst’s projections that were based on a completely different deal at a completely different point in time” during a congressional hearing. The T-Mobile-Sprint merger is being reviewed by the FCC and DOJ. The FCC today resumed the 180-day shot clock on its review of the deal after pausing it last month in order to review a “significant” amount of new information related to the merger that had been submitted by T-Mobile and Sprint. The FCC is now on day 122 of its 180-day timeline. T-Mobile and Sprint have said that they expect the merger to receive approval in the first half of 2019. Can this thing just get approved please!?!?!??! Man it’s literally like the longest running merger attempt in history. Everyone has to complain so they can extract bribe money out of T-mobile. T-mobile will build a park in New York state, promise to unionize some facilities for this union, place small centers here and there for various congress people. It is all the goverment trying to extract things for their districts out of Tmobile’s pocket. They don’t give a hoot about whether T-mobile charges more, they just cry about it, to extract money, not caring that extracted money could force T-mobile to raise prices. I highly doubt 30,000 jobs will be lost – or if they are, they will be replaced almost immediately with 30,000 more, since it would only be because old employees would not want to relocate. The mobile cell industry is growing so fast (well except for Sprint) that they can’t afford to get rid of useful workers. Your first paragraph couldn’t be more spot on. I wish more people understood this. Govt/Pols do NOT give a crap about you or this merger, but basically screeching for bribes. This deal can’t be done soon enough…and it will go through. “Mobile cell industry is growing so fast” … say what?!? That’s why Verizon and AT&T are looking at vertical integration, right? That’s why Samsung and Apple don’t have the sales growth that they had a few years ago. Legere is just spinning these numbers to make it fit his story. “5,600 customer care jobs by 2021” = while I don’t know how Sprint is handling customer care right now (own employees or outsourced third party) so it could look like this: instead of Sprint oustsourcing to third party for customer care, they will instead hire 5,600 jobs. OR if it’s in-house, then they are just relocating those folks or letting them go and hire new ones. “New T-Mobile plans to open 600 new stores to serve rural and small towns” = T-Mobile will close hundreds if not thousands of stores sprint stores that are located next to current T-Mobile stores. What Legere fails to mention is the thousands of corporate jobs that will be lost as the new T-Mobile will not need 2x HR, 2x Marketing, etc… Corporate/HR (workforce) synergies are one of the biggest cost savings and reason to do a merger in the first place. It is growing very fast. Cell phones sales are down because there hasn’t been much new in cell phones so folks are keeping them 3 years instead of two. I don’t see new add on dropping at the big 3. As for verticle integration. A lot of cable companies have purchased cell phone spectrum and are threatening to go into the market while offering video entertainment. I believe Comcast is already trying this – so to avoid losing market share to cable companies and Dish the mobiles are premptively attempting to add content. Again nothing to do with slowing down. In fact I would guess when 5g rolls out in about 5 years we will see almost everything cell connected from cars to refrigerators. So your analysis is at best not complete – at worst ill informed. At current state, net adds are an illusion when it is the results of people from jumping from one carrier to another and then back and forth. There are studies out there that over 95% of the US population own a cell phone. While there may be opportunities in IoT, those do not yield the same ARPU as your normal cell phone. While cable companies may own however much wireless spectrum they want, it’s a zero threat for the wireless companies from a direct competition perspective as the cable companies have zero desire to build a nation-wide wireless infrastructure. That’s why Comcast and Charter wireless services are essentially Verizon MVNO. Well let’s assume all you say is correct. In a stagnant industry companies need to consolidate to stay viable. Therefore TMobile and Sprint make even more sense. Glad you support the merger. By the way this discussion is so old noone is watching any more and I only see it because your notes get emailed to me. They will still be in third place after the merger as you pointed out. So, 5 (five) new centers!? Perhaps haven’t decided on 2 locations. If and when they do, hope it’s in more company friendly States than NY and CA. Correct. They haven’t announced the other 2 locations yet, just that they will open them. And I agree, find more pro-business states, cause CA and NY aint them. CA is the 5th largest economy in the world. Alone CA has a bigger economy than Great Britain. Let me guess, you want a site somewhere close to your mobile home in Alabama? You neo-confederates are not very bright. Actually, why can’t you keep your neighbors from moving out of California? It’s annoying they have to find refuge in other western states. I would expand as little as possible in California. It is in general unaffordable. So do note 8 owners have to wait for this damn merger to happen before we get the pie update? blah blah blah, after they eliminate 4 times as much. Such hogwash. I learned that in my area, T-Mobile recently ignored a landlord’s request to relocate several towers, delivered via certified mail went deliberately un-read. The landlord who was renting space to T-Mobile wanted T-Mobile’s feedback and design 18 month prior to construction on new designs for the condo complex. This occurred not at just one cellular site in my metro area, but a total of eight. As a result of T-Mobile ignoring the letters, including certified mail, the landlords (in past 30 days) took bolt cutters to the locks, and started moving the cell site themselves. Half-hour later, when the technicians came to look into the issue, the landlord handed them copies of the “eviction notices/letters” and told T-Mobile technicians to grab a shovel and take what’s important from the $500k cell site equipment when them. Needless to say, all the PR articles make T-Mobile seem like an expensive $70/month latte when the phone doesn’t work! Perhaps Nancy Victory and Steve Sharkey will stare at it long enough to keep it warm. Still, having two separate, redundant networks (and infrastructure) is the best way to ensure people can send and receive phone calls, especially in an emergency situation. You have only one job, and it’s too bad Legere doesn’t open the mail, and continually points at TV and internet broadband sales opportunities like a kid with attention deficit disorder off his meds.